Masterpiece. That is the easiest and quickest way to describe Guillermo del Toro’s gothic romance The Shape of Water. The Film recently won the Golden Lion at the Venice Film Festival and is the early front-runner to take the Grolsch People’s Choice Award at TIFF this Sunday. It is the 1960’s and mute Eliza (a never better Sally Hawkins) is working as a cleaning lady in a high-tech government facility. While cleaning one of the labs, she discovers what the scientists and top brass refer to as The Asset (Doug Jones) – a fish/human/creature hybrid. Despite the secrecy of his existence, Eliza befriends the creature, changing both of their lives irrevocably. 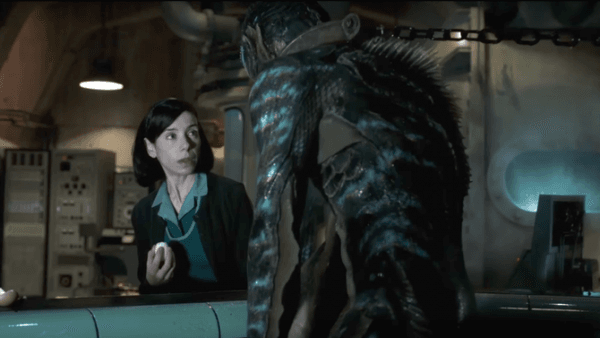 Not since 2006’s Oscar-nominated Pan’s Labyrinth has del Toro been able to marry his incredible visuals with a worthwhile story. But he delivers in spades here, creating a dark fairy tale that is just as much touching and emotional as it is thrilling. It is a breathless and surprising experience that is sure to delight audiences, and is easily one of the top movies of the year. And it’s all the more special because so much of this period piece was filmed in Toronto – including at the Elgin Theatre where it will screen during TIFF.